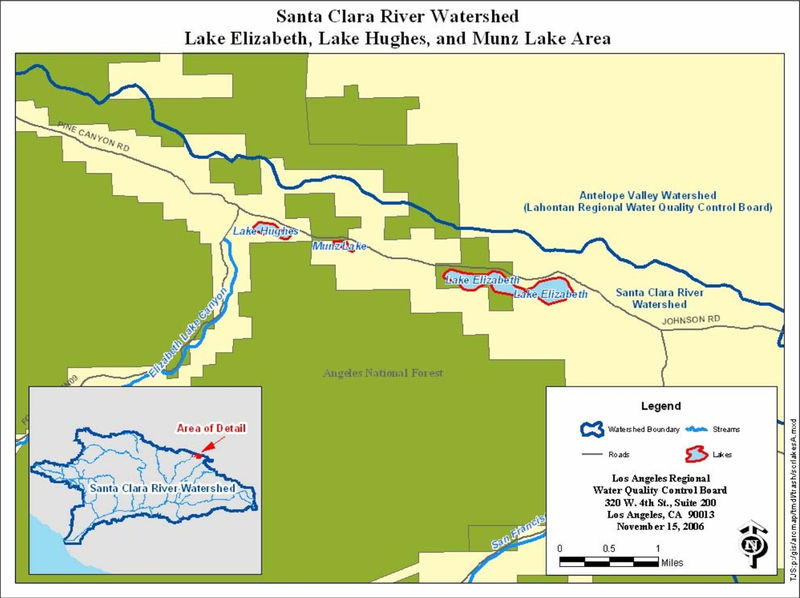 Lake Elizabeth, Munz Lake and Lake Hughes in the Santa Clara River Watershed. Click to enlarge. Lake Elizabeth, Munz Lake and Lake Hughes, at the elevation of 3,300 feet above mean sea level (MSL), are near the headwater of Lake Elizabeth Canyon Creek in the unincorporated community of Lake Hughes. From the fringe of the Mojave Desert, Lake Elizabeth Canyon Creek winds southwest through chaparral-studded hills for approximately 15 miles before reaching Castaic Lake. Castaic Lake is a reservoir for drinking water with capacity of 323,700 acre-feet. Water, combined with water from California Aqueduct, travels through Castaic Lake, continues to be released to Castaic Lagoon, and thereafter enters Castaic Creek. Castaic Creek flows southerly for roughly 5 miles to the City of Santa Clarita where the creek confluences with the Santa Clara River. Lake Elizabeth is in northern Los Angeles County near the village of Lake Elizabeth. Lake Elizabeth is a 123.2 acre natural basin approximately 3 miles wide oriented east-westerly. The depth of the lake varies between wet and dry seasons; generally along the perimeter it ranges from 6 feet to 15 feet, and from 18 feet to 20 feet toward the middle of the lake. (Lund, Anderson and Amrhein, 1994) The eastern portion of Lake Elizabeth is within Los Angeles County unincorporated land while the western shores are under the jurisdiction of the United States Department of Agriculture, Forest Service (USDAFS). The county portion of the Lake with grassy areas and water tanks is fenced in and posted as private property; however sections of fence were damaged and could allow public access. The Angeles National Forest of USDAFS allows the access to Lake Elizabeth via trails and has a recreational area on the northwestern shore of the lake. The primary water source of Lake Elizabeth is the rainfall and runoff from surrounding areas. During the wet season, mostly in the winter, the water flows out at the west end to Munz Lake. Munz Lake, approximately 3,500 feet west of Lake Elizabeth, was built by farming families prior to 1934. This small 6.5 acre, 5 feet deep irregularly shaped lake is completely enclosed by private property, The Painted Turtle, with limited access. The owners have obtained the conditional certification, issued by Los Angeles Water Board on June 2002 for the construction and land use around the lake to host camping and activities for children with terminal illnesses. Munz Lake is surrounded by a grassy yard with boat house on the south shore. Water in the lake mainly comes from wells, rain and runoff, partially from Lake Elizabeth. Munz Lake discharges to Lake Hughes at its west end. Lake Hughes, located in the county unincorporated community of Lake Hughes and approximately 2,500 feet west of Munz Lake, is a natural basin with surface area of 21.4 acres. The depth of the lake ranges from 3 feet near the perimeter to 18 feet at the center during the wet season. The north shore and southwestern shore is occupied by private residential areas, and the remaining shore is covered by vegetation. Most of the residents have direct access to Lake Hughes in their backyards or via alleys among houses. In addition to rain, street runoff and water from Lake Elizabeth and Munz Lake, Lake Hughes is also replenished by underground springs.